Situated in Provence -Cevennes, Montclus has just been voted one of the 'prettiest villages of France ' ! Once part of the castles' guard room, this elegant mellowed stone house has been restored with loving attention combining every comfort with all the original antique features of the past centuries. Large and spacious salon, beautiful dining room and a brand new Provencal style fitted kitchen, the house provides all modern appliances. An outer staircase leads up to the wonderful sun terrace overlooking the river where it is possible to bask in the sun and dine under the stars at night with just the sound of the river and the nightingale in the background. A very smart awning has been installed on the terrace to give shade on the hot afternoons. A perfect family house in the summer months , it is also ideal for two couples in the winter months who enjoy the peaceful situation and the impressive log fires in the evening. With its terraces and windows looking over the river Ceze, this property is for those who appreciate the charm, calm and beauty of a particularly privileged situation in a village where time stands still. Ideal for family holidays or for couples who enjoy the delights of the beautiful climate all year round, the property lies in a quiet pedestrian path just 100 yards away from the lovely beach providing safe swimming for children and even canoes for hire. There is car parking very close by. Perfectly situated for day trips; just an hours drive from Avignon and Nimes even nearer to the 'Gorges de l'Ardeche' and 'Pont du Gard', just over 1 and a half hours to Montpellier with its sandy beaches and wild horses in the Camargue. The famous market town of Uzes is at under an hours drive and its tiny streets and famous market are very popular. Shopping: The village itself is quite tiny and unique and has just one little bar restaurant at walking distance. Shopping can be done at either of the local villages, Barjac and Goudargues, both very pretty market towns with a good choice of shops and restaurants. Daily markets can be found in the villages all around in summer with a great choice of fresh fruit, vegetables and local specialities such as cheese and wine. 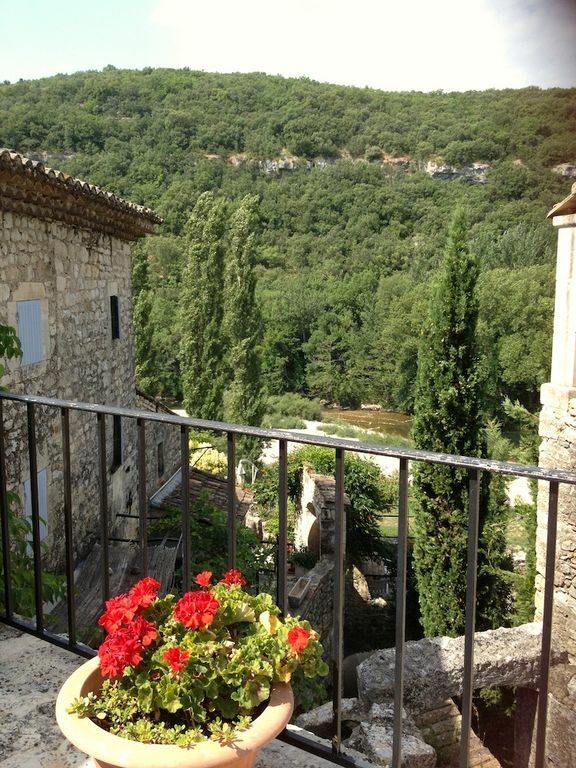 Montclus has just been voted as one of the prettiest villages of France. A place where time has stood still, in the stunning scenery of the Ceze valley. The Ceze river flows gently down from the Cevennes, a real pleasure for children, just enough water to have fun. Lovely beaches in front of the village, ideal for picnics, great for fishermen ! The property is an ideal family house especially in the summer months with the river beaches, clean and lovely , so close to hand. The upstairs terrace is a real sun trap and long summer evenings can be spent dining outside with just the sound of the river. In the winter months, the house is ideal for two couples with the two separate bedroom wings leading off the terrace, each with its own bathroom.